The sleeping arrangements were 8 female in one cabin and 8 males in another cabin, cups of tea were brought each morning at 7 am. It was a very clean ship and had plenty of entertainment organised ie dancing on the deck, music in the lounge and the Maltese who came on board at Malta brought lots of instruments with them. The children had schooling on Mondays Wednesdays and Fridays for two hours per day. The ship stopped at Malta, Port Said, Aden, Colombo, Freemantle, Melbourne Sydney. They were amazed at the colourful bazaars, camels pulling carts, bright coloured clothing and also the poverty and smell of the backstreets of some ports. All the passengers were vaccinated for smallpox, but the scare turned out to be chicken pox just after leaving Colombo. 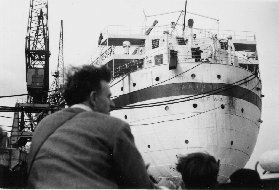 George and Lillian Tubb migrated to Australia with their two children Charles  and Jacqueline  aboard the Asturias, leaving Southampton in March 1952. They were 10 Pound Poms and never regretted the move to improve their lifestyle from that of their post war years. They did miss leaving their families and the England that they knew and liked. They got off the ship in Sydney and caught the train up to Brisbane. They were sponsored by Ron and Mary Blower of Upper Brookfield. They soon aquired two and a half acres of land at Gumdale near Brisbane, where they spent the rest of their lives till illness took Lillian in 1966 and George in a motor accident in 1987. 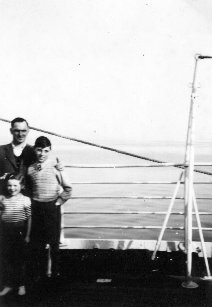 According to the letters that they sent back to the family in England the trip was a great adventure, very good food and plenty of it on the ship. They did go through some rough seas for most of the trip and at times were very seasick.